WARNING: This product can expose you to chemicals including Di(2-ethylhexyl)phthalate (DEHP), Styrene and Diisononyl phthalate (DINP), which are known to the State of California to cause cancer, and Bisphenol A (BPA) and Di(2-ethylhexyl)phthalate (DEHP), which are known to cause birth defects or other reproductive harm. For more information go to www.P65Warnings.ca.gov. Versatile powered mixer, potent speakers and all the accessories, wrapped into one package. 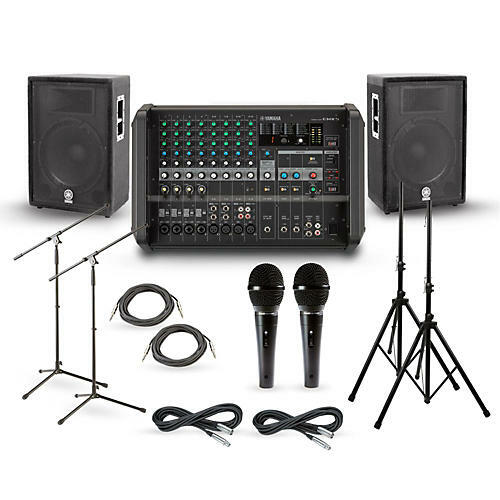 This potent and versatile Yamaha EMX5/Series A live PA package gives you plenty of power with the versatility to monitor and mix the perfect sound for your next live performance, plus all the accessories you'll need to hit the stage. Choose from either 12 in. or 15 in. speakers. Yamaha's workhorse A Series speakers are designed for live PA system use, and are built to stand up to demanding professional use. These 2-way speakers feature a bass-reflex, trapezoidal enclosure with heavy-duty grilles, recessed handles and are covered with durable black carpet. Whether you choose the 12 in. or 15 in. models, the A Series delivers an impressive 300W program handling and 125dB SPL.